Tips and Techniques on how to successfully Paint Outdoor Furniture and Sling Back Chairs Using Spray Paint. I have painted a lot of indoor and outdoor furniture over the years and have picked up quite a few outdoor furniture painting tips and techniques along the way. From the best paints to use for outdoor furniture and accessories to how to prepare and restore metal patio furniture and now even how to paint outdoor furniture with sling seats. These are a big challenge if you don’t want to get paint on the slings. This is my 15 year old outdoor dining table and chairs. The set is in great shape, but the green color has faded and no longer coordinates with my other outdoor furnishings. It needed a color makeover. Armed with a few rolls of ScotchBlue Painter’s Tape and Rust-Oleum Universal All Surface Spray Paint in Hammered Brown I set out to make it happen. After some DIY’ing and a few rain delays, I am now the proud owner of what looks like a brand new set of outdoor furniture. Without the use of ScotchBlue Painter’s tape, I would have had to remove the seat slings from the frames – way too hard. I simply protected the slings before I painted with the tape and newspaper. ScotchBlue™ Painter’s Tape – I needed 2 rolls of the 2-inch wide tape to mask 6 chairs and used half a roll Advanced Multi-Surface tape with Edge Lock for the glass table top. Spray paint – I used 4 cans of Rustoleum Hammered Brown for 6 chairs and the table. Make sure that whatever spray paint that you use is a Primer + Paint formula. Before bringing the chairs to my garage to paint, I ran a sanding block on all the metal surfaces to rough them up a bit. This will help with paint adhesion. I then scrubbed them down with mold and mildew cleaner. I rinsed well and let them dry. I lined my garage with drop cloths and started the job of masking the slings on each chair and the glass on the table so that no overspray paint would get on them. 2. I placed the ScotchBlue Painter’s tape right up to the edge of the metal frame of the chairs. To make sure the tape is sealed and locked into place – run your fingertip over the edge of the tape. Repeat taping on both sides of the top and underside of the chair. 3. I then covered the sling with newspaper and taped it on. I ran my fingertip over the edge on all the tape to make sure it was sealed. This was the most time consuming part of the project. Each chair took about 20 minutes to cover. I set a table up in my garage to set the chairs on, making them easier to cover – no bending down required. After a few hours – I had them all covered and ready for paint. 4. I always spray paint in my garage – plenty of ventilation and light. Even with that, it is important to make sure you wear a mask so you don’t breathe in the fumes and overspray. 5. I sprayed 2 light coats of Rustoleum “spray primer+ paint in one formula” on each chair, letting the first coat dry overnight before applying the second. I let them dry in the garage for 24 hours and then brought them back outside. 6. I kept the tape and newspaper on in case I would see that I missed a section. I did – of course, so I just sprayed the small areas that I missed. 7. After I made sure there was no green showing, I removed the tape and the newspaper. There were a few small spots where the sling met the top of the chair frame that were still green. I used a small piece of ScotchBlue Painter’s tape to mask the sling. I then sprayed the paint into the lid of the spray paint can and dabbed a small tipped paint brush into the lid to pick up some paint. I carefully brushed the paint on. The hammered brown finish updates the outdoor dining set – much better than the green. I also like it since it is a neutral color – it will go with any table setting color scheme I use. It was worth the time and effort to give this classic outdoor dining table and chairs a brand new look. The Rustoleum Hammered Spray Paint truly provides a factory-like finish on metal. Many readers often write to me and ask how a DIY project I wrote about has held up. Well here is one. I wrote this post back in 2013. Since then I have moved to a new house on a lake where the outdoor table and chairs came along and are still in use. After 5 years since I painted the set, this 20 year old set still looks great. Thanks to great paint and proper application. No chipping or peeling. Any suggestions on getting the spray paint off of the chair fabric? I know for me, that even with covering and taping the fabric portion of the chair I will inevitably get some spray paint on the fabric. Suggestions are greatly appreciated! Hi Katie – The best thing to remove spray paint from fabric is to use a little oil on it. Lemon Essential Oil or WD-40. You can also use Motsenbocker’s Lift Off products. They have one for Latex paints and one for spray paint. They both work fast and will remove any paint that gets where you don’t want it. This was very helpful, as I don’t have to remove the covers…Thank you…Sharon. Thanks for this post! There are some really cool ideas here. Keep up the good work on this blog! So glad this article’s message board is still open! The furniture looks great – brand new! Question: The vinyl mesh on my chairs is dingy. Yes, I’ve tried cleaning them using several different products but they remain dingy. Have you heard of anyone painting the mesh? If so, what should I use? I do not know of anyone who has painted the mesh. The problem is that the mesh moves and this can break down the paint quickly. If you want to give it a go, the only thing I think would work for the long run is spray paint that is made for plastic. I would wash the chairs well with hot soapy water and rinse well. Let dry. Spray a very light coat of Rustoleum Plastic Primer. Repeat a few light coats and let each dry. Then use the Rustoleum Plastic spray paint using very light coats until covered. If you put it on thick -it will end up just peeling off. Let it cure for a few days before using and spray it on in the shade and not on a humid hot day. We could have just done a swap! Great post! Been reading a lot about painting my furniture. Thanks for the info here! I am so glad I found your site! We have sling patio furniture that is chipping badly, and I have been starting to sand the chips down. Your idea about putting the chairs on the table is brilliant! I also liked how you showed masking off the sling areas. That is the part I am most worried about. Your post will definitely help. Thank you! These are the wonderful information for painting the furniture.Your style of presentation is very impressive. Thanks for the excellent contribution to the discussion. Absolutely wonderful step by step example of how to paint outdoor furniture like this the correct way. The end result is beautiful, and you chose an outstanding color. Wish Home Depot carried Chalk Paint! Yet another project to do! Found you today via hometalk…lucky me. This article is by far the best thing I have seen this summer!! I have 2 13 year old patio sets that are desperate for an update and 2 brown sling chairs that are calling for some style!! So I pick your post and I so hope your random picker…picks me!! My summer project will be a revamped breadbox! I’ll make an old breadbox into a nifty charging station for all my gadgets. We’re preparing our home for resale on a shoestring budget. I need to repaint 2 old patio tables, a side table, and 2 plant stands. Goodbye rusty green, hello bronze! Our big DIY effort this summer is all about concrete. We’re making our own embossed and stained concrete pavers to create an 18′ round fire pit patio on the sand where our above-ground pool used to sit, inspired by this site. I scored an amazing patio table, chairs and umbrella with stand on craigslist for next to nothing! I was actually wondering if spray painting it would work with it sitting outside. I am going to follow your instructions and try it out! In the meantime, one of my favorite summertime paint projects has be from Emily of DecorChick. She painted her bathroom vanity coral and it is gorgeous. I SO need to paint my patio furniture too! All of our furniture come for free with the house, but it’s pretty crusty! A Home depot gift card could spruce it right up! I love this idea…I also have the green iron furniture outside and inside! I think I’ll do this and update my faded patio umbrella, too! Thanks for the tutorial! I’ve been kicking around refinishing the outdoor furniture but wasn’t sure if I’d need to remove the mesh seats. This is way more cost effective than buying a new set! Next on my list, repainting the dining room chairs. I’ve bought the wood for this project but not the paint……maybe I won’t need to buy it! Thanks for this opportunity Diane – and Home Depot. Helloooo :) Really like what you’ve done with the furniture. Your “new” patio set looks gorgeous! I want to paint a cabinet I bought on Craigslist (for $20!) that resembles the shape of the cabinet in the link below and match the blue and white colors in the link as well. Love the color scheme! I would love to win this to buy painting supplies and new cabinet hardware! I also want to tackle painting my newer nightstands as well, so this will definitely help out! I could have sworn you repainted them blue, not brown! How many cans of spray paint did the job take? I can’t wait to get that done! Along with painting the kid’s rooms as well. Oh how I needed this! We have an 11 year old set which, like yours, was in great shape except for some peeling paint. I haven’t done much DIY and thought I’d have to remove the slings to repaint…thank goodness for your tutorial…I am now encouraged and ready to tackle it! What I would love to do this summer is a backyard fire pit. Painting an old milk can! Love this project, and everything else you do. What a beautiful job! My patio set is a lighter green, but desperately needs a redo, too! I’ve been thinking about painting it and getting new cushions (I wish it was the sling style). I’m in love with this desk over at Mud Pie Studio. It amazing what paint can do! Do you think it’s possible to spray paint cast aluminum patio furniture? I bought an expensive set 5 years ago and it has oxidized and paint has worn off where the winter cover touches the furniture. The warranty has expired so I’m stuck with expensive, ugly furniture. So disappointing. Professional electrolysis painting is suggested but very expensive for a DIY’er. Hi Kim – Yes you can paint it – it will work fine. I would go over the surface with a sanding block to remove any oxidation that may have become raised. Clean it well and if it is bare aluminum, use a metal spray primer on it first, then use your spray paint color of choice. 1 light coat of primer and 2 light coats of paint – let each coat dry before applying the next. Keep the nozzle about 10 inches away from the surface when spraying to get a nice smooth finish. Absolutely love these. They add so much character and so easy to do. Diane, your furniture looks great and does, indeed, look brand new! This post is very timely for me, since I am at the very beginning of painting two wrought iron patio sets. One is black and we have had it since we built our first house back in 1994. The other is green and we inherited with our current house. They are not exactly the same but similar, so I want to spray them with Rustoleum Hammered Bronze spray paint to give them some consistency. The one chair I have partially done looks great! The green set, however, has a lot of rust on it. I’m hoping that by spraying a primer and using the Rustoleum paint, it will last a few more years! One of my very favorite paint projects I have ever seen is a dining set done by Reloved Rubbish in ASCP Coco and Duck Egg Blue. I would LOVE to have that in my home! I am working on a white outdoor set that has lost its sparkle and has some rust spots starting. Not my fav job but I only have four chairs and a round table – so easier than your project! wow, love how this turned out! My patio set is traditional round table and 4 chairs….green…with the little hummingbird design. Not only am I weary of the green, but I hate where it’s started to peel off and is now rusting. It is going to get painted this summer if it’s the last thing I do! just have to find somewhere to do it…no basement, no garage, no shop….*sigh*. But I am encouraged by your success. Currently, I have all my ASCP and brushes bought, and I want to transform my small, antique walnut kitchen table and chairs. I like several of your make-overs, and I enjoy Marian at Miss Mustard Seed. She recently used her milk paint on these bar stool/chairs. I like the way she distresses, and this post is especially tutorial. I never considered painting my outdoor furniture! What a revelation to think I don’t have to throw it out in a couple years when the chips are just TOO many, and I want to change the color. I’m definitely bookmarking this for reference! I love the way you showed touch-up techniques, too. Here’s my favorite outdoor summer diy. Loving your ideas. Don’t remember whose link I followed to find your site (Roadkill Rescue? Infarrantly Creative?). I almost bought a green metal outdoor set but thought ahead 10 years and bought black to spare myself another paint redo. However, when the stupid plastic umbrella ring broke, I headed off to the hardware store and found a pvc pipe flange that was the right diameter since I couldn’t see buying a new table just to replace the ring. Didn’t even bother to paint it. So far, the best summer project I’ve seen is for the DIY tiki torches Brilliant idea. I will be making some for my backyard as soon as I collect enough tins! I would love to try one of these modern bird houses. that looks absolutely amazing!!! The set looks brand new! I painted my parents 15-year old wrought iron set about 8 years ago with Rustoleum black satin and it’s held up amazing and made the set look brand new! It’s finally due for a re-coating. AMAZING! I’ve avoided painting my sling set out of laziness… this is motivating me to get it together and get it done! Thanks for sharing! Great post, I love how the chairs turned out. I’m with you when it comes to disassemble or tape, I go the taping route, too. I would LOVE to have a fence or gate like these colored pencil ones on this blog. So cute! Also, great giveaway, I clicked on a lot of the links to see all the outdoor projects everyone commented on, lots of great things for summer! I almost fell out of my chair when I saw the reveal photo since I fully expected the furiture to have been painted white. HA HA! I LOVE WHITE EVERYTHING and that’s probably why I have spent the better part of my morning at your blog after finding you via Pintrest. I’m enjoying your home tour and LOVE that sideboard and hutch you have in your kitchen. I’m a HUGE carrara marble fan so seeing you faux-create it was a real treat! Before I leave you I must say you are SO RIGHT to have restored your 15-year old patio furniture set. They just don’t make them (anything!) the way they used to so repainting it was brilliant. More old things should be restored to new instead of being cast aside. So… Bravo and well done! I’ll be back to visit your blog every day! On my list of summer projects. I like the set that I have, I just don’t like the color. Great way to keep what you have with a new look. Can’t wait to try it. As always I love your site. Such wonderful ideas. Along with painting my outdoor furniture like you did this is want I want to do next . Isn’t it GORGEOUS! Great project as always! I have a chair that is in need of a paint job and now I feel inspired and obligated to get it done! Oh, I definitely love this project! Thanks for the tutorial! Thanks for all the inspiration Diane! LOVE YOUR BLOG! given me a push to get it done! Actually this post is what I wanted to use as a link for, as it is now my favorite, but since I didn’t know if linking to this same post was allowed I’ve selected another. first of all…love,love,love your chairs and table. Looks gorgeous. I would love this in my front yard!!! We are planning on updating our deck as well. Our plan is to add a pergola/covering to it, like this one and that gift card to Home Depot sure would help us get it done!! Thanks for a GREAT giveaway!! This DIY painted peacock chair is beautiful! This current post is my favorite as we have a similar table that needs updating and I can’t wait to get to Home Depot to get this paint. Love to have the gift card to add perennials to my work in progress. Great giveaway! Your projects are always great and informative. I would love to create a butterfly garden. My daughter Alea loves butterflies. Winning the gift card would get us started on the right foot. Thanks. I really love how your table and chairs turned out, looks like a brand new set. I love painting older furniture to give it a new look. I recently bought a bed for my daughter at an estate sale for $10 and repainted it. I was inspired by this article and others I have seen on Pinterest. Thanks for your ideas!! i’m going to go with this post because it looks great and I learned some painting/taping techniques! I loved Sand and Sisal’s Faux Etched Glass table. That looks like something I could do. Diane, I’m linking your project right back at you! I no longer have the chairs but I have 2 smaller tables that are sadly sitting on my patio waiting for a transformation. This is the idea I have been waiting for! Thanks for sharing it! I would love to build a raised garden bed and start learning how to garden. I love how your patio set turned out. The paint really transformed it and it looks great! My favorite paint makeover is of a thrifted wrought iron piece I bought last summer. I gave it a makeover with my favorite Oil Rubbed Bronze paint and I love it! I desperately want and need a Firepit at the Lake. I saw this and I am still looking, as I have other ideas. LOL!!! I want to use paint, and also some old items which I have waiting to be reused. If I am the lucky winner, I will definitely have a worthy project on my hands!! Diane, I love this project. I almost put a link to it–but decided that would be cheating :-) Your table set really does look brand new! Thanks for the giveaway! Since I didn’t use your project, I chose one by Cindy Harvey of Cottage Instincts. I’m submitting the link to the first of our outdoor improvements saga. I actually tagged you in this one because I made your concrete fire columns! Now I know why RH uses gel fuel. Candles aren’t holding up so well in this Texas heat lol. I used hammered bronze on my furniture, and agreed, they look so fresh and new. Yours are beautiful. I love this IKEA Rast DIY project. I’ve already bought 2 Rasts to do this to! I want to do this project for my yard and paint it a fun color, like robin egg blue. I really thought that the bench at was adorable. I have a chair that I might do that to! 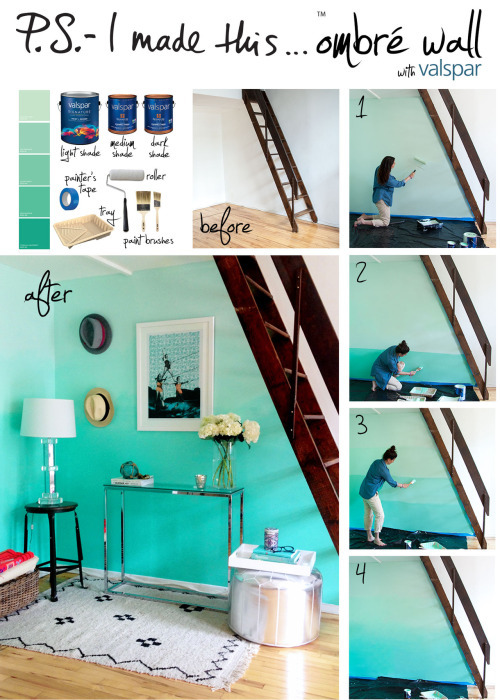 This DIY paint project is on my to-do list. Hopefully soon! Wow, what a transformation. It’s good to know you can do this since it’s such a money savings! Your how-tos are always so good, Diane! I am getting ready to paint some outdoor furniture, but it’s wooden, so my techniques will be a little different. Something I’ve bookmarked as a “want to do this” is this beverage cooler – how fun! Of course, I have another project after seeing your patio furniture redo. Love the way they turned out! Summer DIY toy grill for your kids to play with. I would like to paint an old chair we have. Thanks for the giveaway. I love your patio furniture and wow does it look brand new now or what!!! You also have the patience of Job I believe. Looks to be a very tedious and time consuming job, but well worth the outcome. It looks gorgeous. Since we have a baby due in August, our summer projects are more centered around finishing up the nursery than anywhere else. We lack a lot of storage in that room since it was just a guest room, so my husband is going to be building me some storage units to make up for it. These are what we have in mind! Nice work on the furniture! I’m also using your kitchen cabinet painting tutorial. And when we’re outside enjoying our summer “kitchen,” I’d love for my nieces to have their own portable play kitchen DIY’d from an old microwave oven table. Our bathroom is done in lighthouses but no room to add more-so I’m thinking of spilling it into the yard..which is pretty bland right now! I love the barn wood faux paint. I always love your projects. This looks great! I love this sewing table made into a planter. I’ve thought about making over some kind of old furniture piece and plunking it into my garden. Best outdoor project: Project Deck! We painted it with a sealer/stain from HD. It’s holding up great a year later. Next on my list for outside is some brightly colored planters. I really want to make an outdoor chalkboard to go on the huge blank house wall next to my patio. It’s on my HUGE list of summer projects. I’ve got my frames ready. Now I’m trying to select paint colors. I really want to stencil my powder room this summer. I’m thinking navy with white. Inspired by this blog post. I would love to paint my kitchen cabinets white but am too chicken. I read many blog posts online where people paint them with no problems. I’ve attached one of the many links I’ve looked at. I enjoy reading your blog – thanks for the chance from Home Depot. I ventured down the plumbing aisle for the first time to make a collection of these wine bottle torches using citronella. They are conversation starters as well as being useful for light and keeping the bugs away! I have plastic patio furniture (no I am not in college, but it makes it easy to stack and put away in the garage to clear up the tiny yard when I am not using the table) :) The table is green plastic, two chairs are black, and two chars are white. I want to paint them all a nice bright glossy red so they coordinate and give my yard a pop of color. Was thinking I’d do stripes on the table top too, just to gussy it up a little…that is where the painter’s tape comes in! My favorite summer DIY: Tool caddy turned planter by painting our house number on the front! I would love to build a patio with outdoor fire pit to enjoy the beautiful southern nights. I have 2 patio sets on my deck, one that was my parents a beige round set and then my original one in white, probably 20 years old. The white powder coating is chipping where the chairs stack, I would love to get that taken care. You inspire me, now just to find the time! A small, doable project with big impact! It looks like you got a brand new set, Diane! Love the brown. We had a green set similar to yours at our old house. If we hadn’t moved I would have had to do something with it, because not only was it fading, but the green from the table would come off on hands or legs if you touched it. It was too big to bring with us when we moved so we left it behind.